The Australian documentary “Change My Race” explores how Western beauty ideals are influencing a rising pressure amongst Asian women to get cosmetic surgery. The documentary maker Anna Choy is an Asian-Australian woman who has struggled with her looks in the face of racism growing up. She speaks to women from various backgrounds who have a desire to look more White as a direct result of the racism they have endured. The most heart-breaking story for me is the 17 year old schoolgirl whose parents pressure her into getting surgery, which they think will help her be more successful. 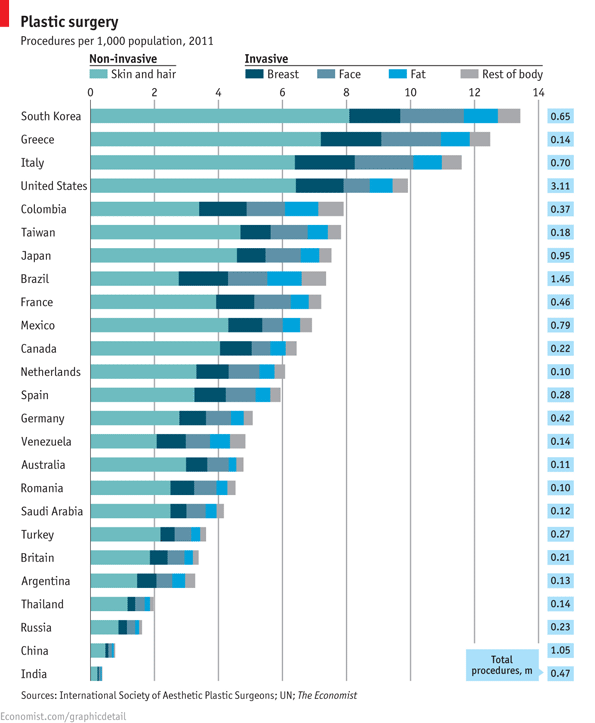 The International Society of Aesthetic Plastic Surgeons reports that South Korea leads the number of cosmetic procedures. The most common surgeries overall include lipoplasty and breast augmentation. Documentary via SBS. Graphic via Sociological Images.